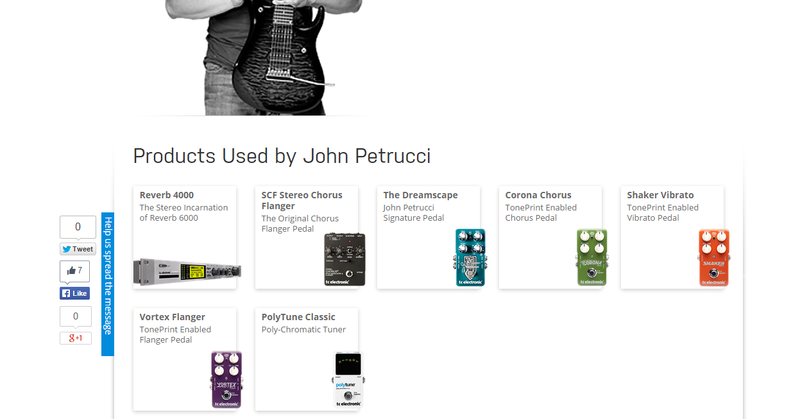 On this [artist page](http://www.tcelectronic.com/john-petrucci/) for John Petrucci of [The G3 Jam](http://equipboard.com/band/the-g3-jam), [Dream Theater](http://equipboard.com/band/dream-theater), [Liquid Tension Experiment](http://equipboard.com/band/liquid-tension-experiment), [John Petrucci & Jordan Rudess](http://equipboard.com/band/john-petrucci-jordan-rudess), [explorers club](http://equipboard.com/band/explorers-club), and [Nightmare Cinema](http://equipboard.com/band/nightmare-cinema), is his T.C. Electronic pedals on display, among them is his TC Electronic Stereo Chorus Flanger. Robbie Robertson uses this effect as seen on his official websites gear collection. The TC Electronics Stereo Chorus Flanger can be seen on Eric Johnson's pedal board in this Premier Guitar interview at (3:10). For the Three Kings tour, Bonamassa is using a simplified pedalboard with the Stereo Chorus/Flanger behind his amps on a subtle setting. According to TC Electronic's [website](http://www.tcelectronic.com/paul-gilbert/), Paul Gilbert uses a TC Electronic Stereo Chorus Flanger. Brian uses a Stereo Chorus Flanger pedal, according to [TC Electronic](http://www.tcelectronic.com/brian-may/). At 19:50 Sonny talks about the TC Chorus mentioning its clarity and that it is not getting in the way. In this "Rig Rundown" from *Premier Guitar* Brendan shows us this pedal at 5:30 saying "it’s like seen better days but sounds great." According to Aerosmith bassist Tom Hamilton's guitar tech, the TC Electronic Stereo Chorus Flanger is "the best flanger on the market." It can be seen in this interview at (0:40). 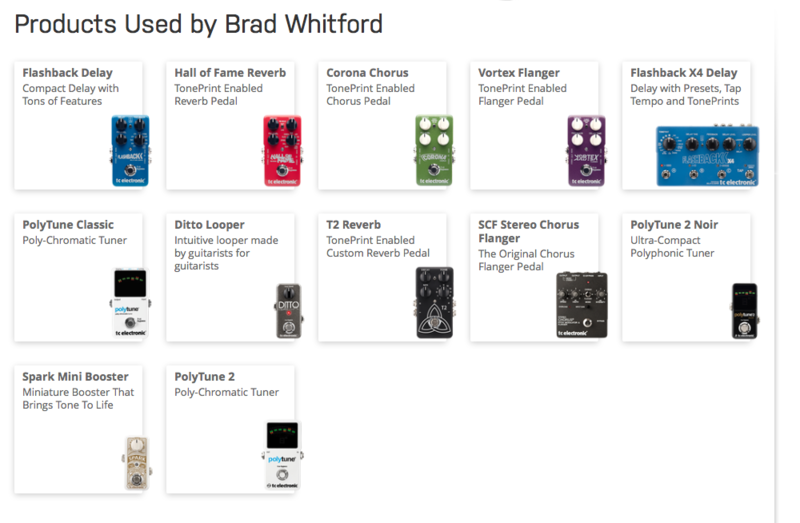 According to [TC Electronic](http://www.tcelectronic.com/brad-whitford/), Brad uses an SCF Stereo Chorus Flanger pedal. At 12:16, he begins naming equipment he's got at home. Approx. 5-6 seconds later he claims he has a Flanger at his place. "Squire, who felt that certain effects were better matched with neck or bridge pickups, rewired his Rickenbacker with stereo outputs in the early ’70s. Onstage, he used a boatload of vintage effects, including Maestro Fuzz-Tone, TC Electronic Stereo Chorus Flanger, TC Nova Reverb, Boss OC-3 Super Octave, Mu-Tron III, and custom-made tremolo pedals. He played Moog Taurus bass pedals, eventually triggering samples from an E-Mu ESI2000 sampler." In this photo, Brian appears to be using TC Electronic Stereo Chorus Flanger pedal. The SCF can be seen in the middle of this pedal board, just above the Boss Tuner. 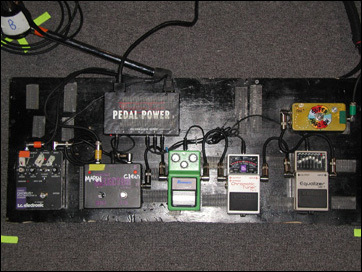 According to the Reverb's website, Felder's pedalboard for "Hell Freezes Over" also included the TC Electronic Stereo Chorus/Flanger. seen on top of the picture. In this pedalboard photo taken by Hatherley on her Instagram profile, the TC Electronic Stereo Chorus Flanger can be seen. It can be seen as one of his pedal in his pedalboard from this photo in this tweet from 15 Sep 2013. This photo was taken in 2011 during Rosenwinkel's concert in The Charles Hotel in Boston. More photos can be seen [here. 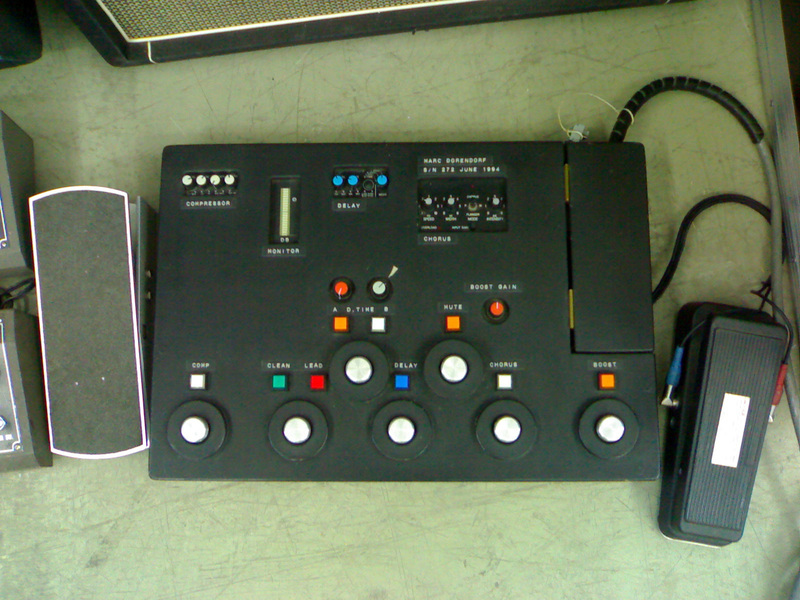 ](https://www.flickr.com/photos/gsmaz1/sets/72157628179367269) In this particular pedalboard photo, one of the pedals that can be seen is the TC Electronic Stereo Chorus Flanger. Can be seen here in the cover photo of his pedals on facebook. As part of his smaller Pete Cornish guitar effects unit, Marc Dorendorf uses pedalboard built-in effects stomp boxes (Boss CS-2, Boss DD-3, TC SCF) with modified effect activator switches and LED displays handmade by Cornish. "I use an Ibanez RG270DX for drop d, an Epiphone Black Beauty for standard and drop d, a Fender Mexican Stratocaster. A Hiwatt T20, and a hiwatt 1x10 speaker. My pedal board a Dunlop Crybaby, a Vick Audio Overdriver, a Boss MT-2, a MXR EVH Phase 90, a Boss PH-3, Tc Electronic Chorus+, a Tc Electronic Sustainer and Parametric Eq,a MXR Jimi Hendrix Univibe, an Electro Harmonix Big Muff,and an MXR Dyna Comp. For Synthesizers I use a MiniMoog and a Stylophone." The TC Electronic Stereo Chorus Flanger is the ultimate chorus pedal. Sparkling, true stereo sound. Pitch modulation, chorus, or flange with 100dB quiet operation and 20Hz-20kHz frequency range. Features width, intensity, speed, and a mode selector switch, plus gain-adjustment overload indicator. On/off LED and built-in power supply for AC operation. The absolute fattest, richest, chorus/flange sound in existence. i'd compare this to my mxr bass chorus deluxe and their both very simular. get the tc electronic stereo chorus if you want a subtle chorus and pitch modulation. great natural tone, but more subtle than the mxr bass chorus. the mxr bcd is just deluxe. you can set how dry or wet the signal is. the size of the tc is slightly bigger. it's not a big difference. the tc stereo chorus can not be powered by a powet supply. it has a permanently plug built into it. mxr definitely based the mxr bcd off the tc electronic stereo chorus. i'd suggest the mxr over the tc. the mxr is smaller, can be powered by a 9v power supply, and it's dryer on the E string. overall a modern take on the tc electronic. also, their is the ebs unichorus studio version. more a subtil kind of chorus. gives you nice and natural movements to your sounds. Essentially, the SCF combines three effect types. All of them modulation effects: Chorus, Pitch Modulation and Flanger. Operation is simple as you simply flick a 3-way switch to choose the effect type you want. From then on, the three control knobs are the same regardless of the effect type you’ve selected. I use it only as a stereo chorus on my small board. First, you have a SPEED knob that defines – well – the speed of the modulation going on. Second, you have a WIDTH knob, which is equivalent to the DEPTH knob on many other modulation pedals. Finally, you also get an INTENSITY knob that works a bit differently in each mode. For chorus it sets the wet/dry mix balance, for flanger it sets the feedback and in pitch modulation mode it increases the intensity of the effect amount gradually. I use this for leads and funky sounds. It doesn't really have anything special attached to it, I just use it when I need to. Since listening to Eric Johnson as a kid and then Jamie West Oram recently, I wanted a chorus that had a little extra punch. I also love the organic flange sounds of the pedal. This pedal is the perfect chorus and there is a reason its on a lot of boards! The workhorse standard in the Industry by most of the great and pros in and out of the Studio. A truly magnificent and unfortunately discontinued Stereo Chorus.